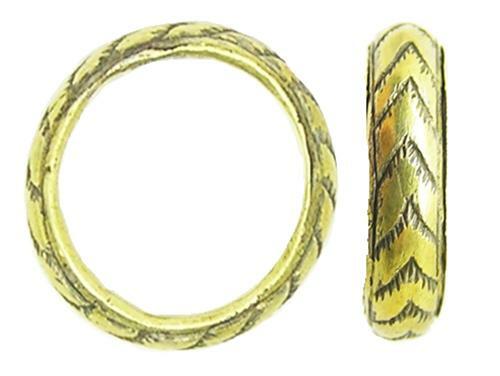 This is a beautifully crafted Renaissance silver-gilt finger ring, dating to the 16th - 17th century. The ring is formed in two parts, expertly formed into a complete round ring. The main body beaten from a thin sheet of silver dished and decorated with chevron design. The inside of the ring formed from a thin sheet of silver, enclosing the back of the ring. It is hollow and weighs 1.5 grams, the size and shape would have normally been cast in one piece, using at least 9 grams of silver (for this size and shape of the ring) rather than just 1.5 grams this would have been about the weight of a silver groat (4d) of this date. The design and construction of this ring is quite stable and strong, similar 'hollow' rings have also been found with posy inscriptions. I believe this ring to have been intended as a wedding band, the size would suggest a young lady. The gold mercurial gilding is intact, of a superb honey yellow gold. A great looking ring, and in a very good excavated condition. PROVENANCE: Ex. German Private Collection.